Two domains linked to the alleged “Achieve Community” pyramid- and Ponzi scheme appear to have been disconnected. On Feb. 17, the PP Blog reported that the domains — ReadyToAchieve.com and TheAchieveCommunity.com — were displaying “Account Suspended” messages. ReadyToAchieve appears still to have DNS servers, but now displays nothing and will not return a ping. TheAchieveCommunity, meanwhile, displays a “no nameserver” message in registration data. In a complaint filed under seal in U.S. District Court for the District of Colorado on Feb. 12, the SEC described Achieve as a pyramid- and Ponzi scheme operated by Kristine L. Johnson of Colorado and Troy A. Barnes of Michigan. The agency announced the case on Feb. 18, after the seal was lifted. Both Johnson and Barnes have asserted their Fifth Amendment rights not to incriminate themselves in the SEC case. Barnes reportedly has claimed he’s under criminal investigation, although it is unclear where and by whom. Both ASD Updates and BehindMLM.com have reported Johnson is the subject of a criminal investigation by the office of U.S. Attorney Anne M. Tompkins of the Western District of North Carolina. Tompkins is leaving her post today, after nearly five years on the job. North Carolina is a banking center, and Tompkins has become known for her role in bringing cases involving multimillion-dollar investment schemes, securities fraud and mortgage-fraud conspiracies. One such case was the criminal prosecution of three figures associated with Zeek Rewards, an alleged Ponzi scheme said to have gathered on the order of $897 million. Why Johnson, a Colorado resident charged civilly by the SEC in Colorado federal court last month in the Achieve case, is under criminal investigation in North Carolina is unclear. Zeek receiver Kenneth D. Bell has raised concerns about network marketers proceeding from one fraud scheme to another. At least one filing in the Achieve case in Colorado suggests Zeek and Achieve had promoters in common, given that the woman who filed the document asking for her Achieve money back also is listed by Bell as a “winner” in the Zeek scheme broken up by the SEC and the U.S. Secret Service in 2012. 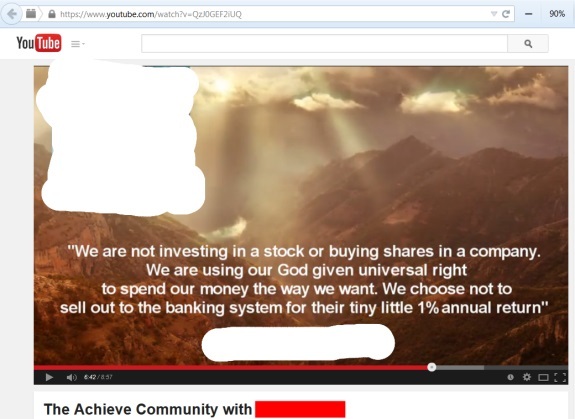 One promo for Achieve claimed its members had the “God given universal right” to spend their money however they pleased and were choosing “not to sell out to the banking system.” Among other things, Achieve claimed $50 turned into $400. In court filings, the SEC said it has examined at least five Achieve-related bank accounts. The filings also suggest Achieve polluted the commerce stream at at least least nine points of contact: three banks, one credit union, four payment processors and one brokerage firm. Johnson is alleged to have provided $10,000 to a church. One or more churches sent money to Zeek Rewards, according to court filings. Because an untold number of Achieve members received debit cards that could be used at ATMs to offload “earnings,” fraudulent proceeds had the potential to flow through many hundreds of towns and cities, effectively turning local banks into dispensaries for Ponzi schemes or warehouses for them. Achieve is said to have had between 9,000 and 14,000 members. Ads for other fraud schemes were displayed when Achieve members accessed the “program’s” private forum, contributing to concerns that fraudulent proceeds are circulating between and among scams.